First art post! Here are some old work from Ratchet and Clank Future: Tools of Destruction. I didn't take any screenshot of my work which I am ashamed of today but at lest I found these images. Ratchet's armors: I believe the production time on these were 1 week on each armor set. That includes High res, low res, uvs, textures and shaders. Pretty much everything was done in a week or so on RCF which seems a bit crazy to me now. 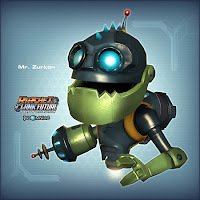 Mr Zurkon, he is a fan favorite and still remained in every ratchet and thereafter as you'll see later when I start posting stuff from RCF2. I really wish I had screenshots of stuff I made on RCF but that's all I've found on my hard drive 5 years later.